On Saturday March 19th, Team 501 participated in the 2nd annual Goffstown Business Expo. The event was held at Goffstown High School. Several Goffstown High Team 501 students ran a booth to help support our team and spread the word of FIRST. Our 2007 robot, A-Rack-No-Phobia, was present and drew a lot of attention from visitors. Our team also raffled off several iPods to support us financially. Many visitors were seeking more information about FIRST in general as well as the FLL and Jr. FLL programs. 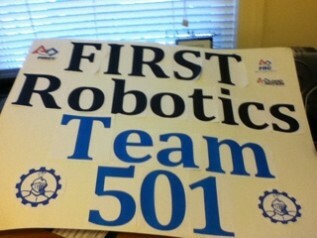 We also raised awareness of FIRST summer camps, the current FRC game, offseason competitions, and the history of FIRST. The crowd seemed to enjoy having us there and our team had a great time spreading the word of FIRST throughout the local community.